The Richmar MicroBlock Anti-Microbial Electrodes are designed to inhibit and kill growth of common disease-causing bacteria in electrotherapy devices. These electrodes can play an important part in infection prevention for hospitals and healthcare facilities, making MicroBlock a great choice for decreasing the risk of healthcare associated infections while treating your patients. MicroBlock anti-microbial electrode surface reduces the risk of contamination while creating better infection control by killing disease-causing microbials and common antibiotic-resistant threats that contact the surface of the device. 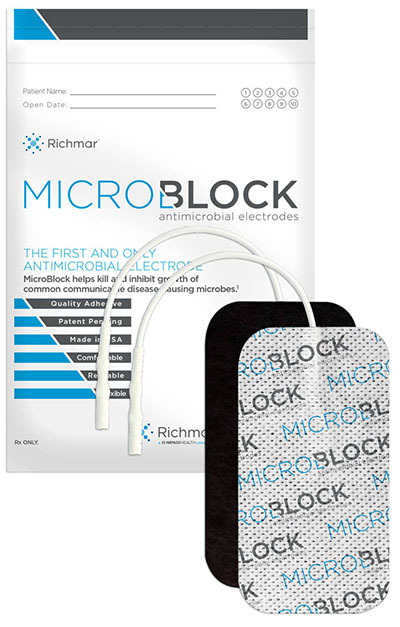 The Richmar MicroBlock Anti-Microbial Electrodes are designed to inhibit and kill growth of common disease-causing bacteria in electrotherapy devices. These electrodes can play an important part in infection prevention for hospitals and healthcare facilities, making MicroBlock a great choice for decreasing the risk of healthcare associated infections while treating your patients. MicroBlock anti-microbial electrode surface reduces the risk of contamination while creating better infection control by killing disease-causing microbials and common antibiotic-resistant threats that contact the surface of the device. These electrodes each measure 2 by 2 inches and are square in shape. There are 10 packs of 4 electrodes per case. 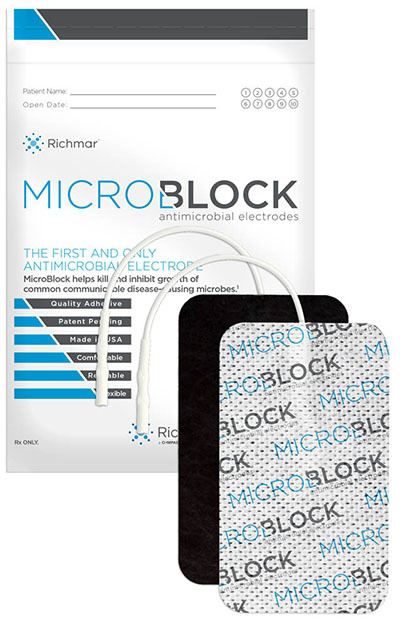 Dimensions: 1.5" x 11" x 8"
The Richmar MicroBlock Anti-Microbial Electrodes are designed to inhibit and kill growth of common disease-causing bacteria in electrotherapy devices. These electrodes can play an important part in infection prevention for hospitals and healthcare facilities, making MicroBlock a great choice for decreasing the risk of healthcare associated infections while treating your patients. MicroBlock anti-microbial electrode surface reduces the risk of contamination while creating better infection control by killing disease-causing microbials and common antibiotic-resistant threats that contact the surface of the device. These electrodes each measure 2 inches and are round in shape. There are 10 packs of 4 electrodes per case. 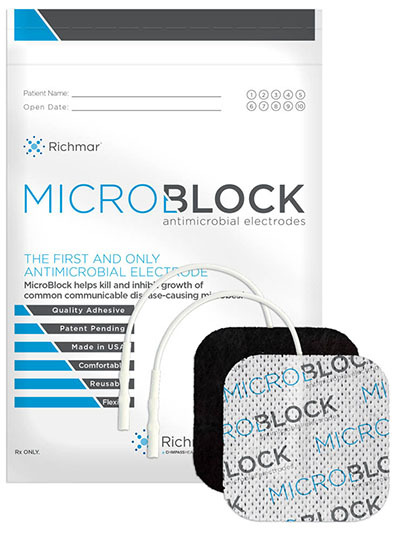 The Richmar MicroBlock Anti-Microbial Electrodes are designed to inhibit and kill growth of common disease-causing bacteria in electrotherapy devices. These electrodes can play an important part in infection prevention for hospitals and healthcare facilities, making MicroBlock a great choice for decreasing the risk of healthcare associated infections while treating your patients. MicroBlock anti-microbial electrode surface reduces the risk of contamination while creating better infection control by killing disease-causing microbials and common antibiotic-resistant threats that contact the surface of the device. These electrodes each measure 3 inches and are round in shape. There are 10 packs of 4 electrodes per case. 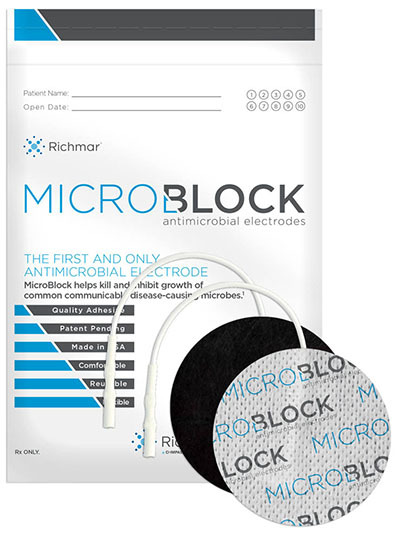 The Richmar MicroBlock Anti-Microbial Electrodes are designed to inhibit and kill growth of common disease-causing bacteria in electrotherapy devices. These electrodes can play an important part in infection prevention for hospitals and healthcare facilities, making MicroBlock a great choice for decreasing the risk of healthcare associated infections while treating your patients. MicroBlock anti-microbial electrode surface reduces the risk of contamination while creating better infection control by killing disease-causing microbials and common antibiotic-resistant threats that contact the surface of the device. These electrodes each measure 2 by 3.5 inches and are rectangular in shape. There are 10 packs of 4 electrodes per case. 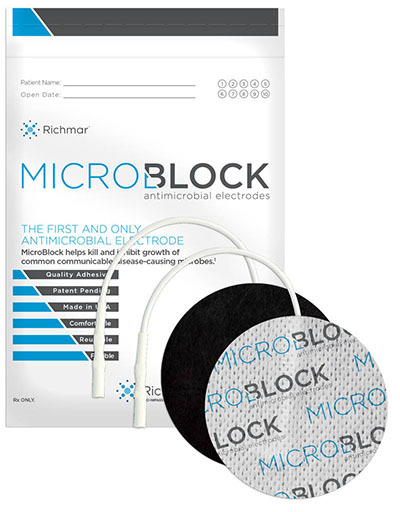 The Richmar MicroBlock Anti-Microbial Electrodes are designed to inhibit and kill growth of common disease-causing bacteria in electrotherapy devices. These electrodes can play an important part in infection prevention for hospitals and healthcare facilities, making MicroBlock a great choice for decreasing the risk of healthcare associated infections while treating your patients. MicroBlock anti-microbial electrode surface reduces the risk of contamination while creating better infection control by killing disease-causing microbials and common antibiotic-resistant threats that contact the surface of the device. These electrodes each measure 3 by 5 inches and are rectangular in shape. There are 10 packs of 2 electrodes per case.